Ava Marie DuVernay (/ˌdjuːvɛərˈneɪ/; born August 24, 1972) is an American film director, producer, screenwriter, film marketer, and film distributor. DuVernay won the directing award in the U.S. dramatic competition at the 2012 Sundance Film Festival for her second feature film Middle of Nowhere, becoming the first black woman to win the award. For her work on Selma (2014), DuVernay was the first black female director to be nominated for a Golden Globe Award. With Selma, she was also the first black female director to have her film nominated for the Academy Award for Best Picture. In 2017, she was nominated for the Academy Award for Best Documentary Feature for her film 13th (2016). DuVernay's 2018 fantasy film A Wrinkle in Time, had a production and marketing budget between $150 million and $250 million, making her the first black-American woman to direct a live-action film with a budget of that size. That film also made her the first black-American woman to direct a film that earned at least $100 million domestically, though the movie failed to turn a profit. DuVernay was raised with her four siblings, her mother, Darlene Maye, an educator, and her father, Murray Maye. She grew up in Lynwood, California, which is near Compton. During her summer vacations, she would travel to the childhood home of her father, which was not far from Selma, Alabama. DuVernay said that these summers influenced the making of Selma, as her father saw the 1965 Selma to Montgomery marches as a small child. In 1990, DuVernay graduated from Saint Joseph High School in Lakewood. At the University of California, Los Angeles (UCLA), she was a double BA major in English literature and African-American studies. DuVernay's first interest was in journalism, a choice influenced by an internship with CBS News, where she was assigned to help cover the O.J. Simpson murder trial. DuVernay became disillusioned with journalism however, and decided to move into public relations, working as a junior publicist at 20th Century Fox, Savoy Pictures, and a few other PR agencies before opening her own public relations firm, The DuVernay Agency, also known as DVAPR, in 1999. Through DVAPR she provided marketing and PR services to the entertainment and lifestyle industry, working on campaigns for movies and television shows such as Lumumba, Spy Kids, Shrek 2, The Terminal, Collateral, and Dreamgirls. Other ventures launched by DuVernay include Urban Beauty Collective, which was a promotional network that began in 2003 and had more than 10,000 African-American beauty salons and barbershops in 16 (20 since 2008) U.S. cities which were mailed a free monthly Access Hollywood-style promotion program called UBC-TV, the African-American blog hub Urban Thought Collective in 2008, Urban Eye, a two-minute long weekday celebrity and entertainment news show distributed to radio stations, as well as HelloBeautiful, a digital platform for millennial women of color. In 2005, over the Christmas holiday, DuVernay decided to take $6,000 and make her first film, a short called Saturday Night Life. Based on her mother's experiences, the 12-minute film about an uplifting trip by a struggling single mother (Melissa De Sousa) and her three kids to a local Los Angeles discount grocery store toured the festival circuit and was broadcast on February 6, 2007, as part of Showtime's Black Filmmaker Showcase. DuVernay then moved on to documentaries because they can be done on a smaller budget than fiction films, and she could learn the trade while doing so. In 2007, she directed the short Compton in C Minor for which she "challenged herself to capture Compton in only two hours and present whatever she found." The following year, she made her feature directorial debut with the alternative hip hop documentary This Is the Life, a history of LA's Good Life Cafe's arts movement in which she participated as part of the duo Figures of Speech. In 2011, DuVernay's first narrative feature film, I Will Follow, a drama starring Salli Richardson-Whitfield, was released theatrically. DuVernay's aunt Denise Sexton was the inspiration for the film. The film cost DuVernay $50,000 and was made in 14 days. Roger Ebert called it "one of the best films I've seen about coming to terms with the death of a loved one." I Will Follow was an official selection of AFI Fest, Pan-African Film Festival, Urbanworld and Chicago International Film Festival. In the summer of 2011, DuVernay began production on her second narrative feature film, Middle of Nowhere, off a script she had written in 2003 but couldn't get financed then. The film had its world premiere on January 20 at the 2012 Sundance Film Festival, where it played in U.S. dramatic competition and garnered the U.S. Directing Award: Dramatic for DuVernay, the first African-American woman to ever win the prize. DuVernay also won the 2012 Independent Spirit John Cassavetes Award for her work on the film. DuVernay was commissioned by the Smithsonian's National Museum of African American History and Culture to create a film which debuted at the museum's opening on September 24, 2016. This film, August 28: A Day in the Life of a People, tells of six significant events in African-American history that happened on the same date, August 28. The 22-minute film stars Lupita Nyong'o, Don Cheadle, Regina King, David Oyelowo, Angela Bassett, Michael Ealy, Gugu Mbatha-Raw, André Holland and Glynn Turman. Events depicted include William IV's royal assent to the UK Slavery Abolition Act in 1833, the 1955 lynching of 14-year-old Emmett Till in Mississippi, the release of Motown's first number-one song, "Please Mr. Postman" by The Marvellettes, Martin Luther King, Jr.'s 1963 "I Have a Dream" speech, the landfall of Hurricane Katrina in 2005 and the night then-senator Barack Obama accepted the Democratic nomination for president at the 2008 Democratic National Convention. DuVernay directed Selma, a $20 million budget film produced by Plan B Entertainment, about Martin Luther King, Jr., Lyndon B. Johnson, and the 1965 Selma to Montgomery march. The movie was released on December 25, 2014 to critical acclaim. For the film she did uncredited re-writes of most of the original screenwriter Paul Webb's script with an increased emphasis on King and the people of Selma as central figures. In response to the criticisms of historians and media sources that accused her of irresponsibly rewriting history to portray her own agenda, DuVernay pointed out that the film is "not a documentary. I'm not a historian. I'm a storyteller". The film was nominated for Best Picture and Best Original Song, but not Best Director, at the Academy Awards. The lack of diversity of the Oscar nominations for 2014 was the subject of much press, especially on Twitter, and the film of the only person of color that was nominated for the 87th Academy Awards. The award for Best Original Song went to "Glory" from Selma. DuVernay stated that she had not expected to be nominated so the omission didn't really bother her; rather she was hurt by actor David Oyelowo not being nominated. As to the question of racial diversity of awards, she stated that the obstacles to people of color being represented in the Academy Awards were systemic. In July 2016, the New York Film Festival made the surprise announcement that 13th, a documentary directed by DuVernay, would open the festival. Until the announcement no mention of the film had been made by either DuVernay or Netflix, the film's distributor. Centered on race in the United States criminal justice system, the film is titled after the Thirteenth Amendment to the United States Constitution, which outlawed slavery (unless as punishment for a crime). DuVernay's documentary opens with the idea that 25 percent of the people in the world who are incarcerated are incarcerated in the U.S. and argues that slavery is being effectively perpetuated in the U.S. through mass incarceration. The film features several prominent activists, politicians, and public figures such as, Angela Davis, Bryan Stevenson, Van Jones, Newt Gingrich, Cory Booker, Henry Louis Gates Jr., and others. It was released on October 7, 2016 on Netflix. 13th has garnered acclaim from film critics and is currently at a 97% rating on Rotten Tomatoes based on 69 reviews, with the critical consensus that states: "13th strikes at the heart of America's tangled racial history, offering observations as incendiary as they are calmly controlled." In 2017, the film was nominated for an Academy Award for Best Documentary Feature at the 89th Oscars, making DuVernay the first black woman to be nominated as a director by the academy in a feature category. The film also won a Peabody Award in 2017 and a Columbia Journalism School duPont Award in 2018. In 2010, it was announced that Disney carried the film rights to the 1962 novel A Wrinkle in Time. Following the success of Tim Burton's Alice in Wonderland, Disney announced the hire of Jeff Stockwell to write the screenplay for Cary Granat and his new Bedrock Studios. Cary Granat had previously worked with Disney on the Chronicles of Narnia and Bridge to Terabithia films. On August 5, 2014, Jennifer Lee was announced as the screenwriter, taking over from Stockwell, who had written the first draft. On February 8, 2016, it was reported that DuVernay had been offered to direct the film, and she was confirmed as director later that same month. A Wrinkle in Time began filming in November 2016. DuVernay is the first woman of color to direct a live-action film with a budget of over $100 million, and the second woman to do so after Patty Jenkins (who directed Wonder Woman). The film was released in March 2018 and brought in $33 million its opening weekend, second at the box office behind Black Panther. Following Disney's Q2 earnings report in May 2018, Yahoo! Finance deduced the film would lose the studio anywhere from $86–186 million. Upon release, the film received mixed reviews, with critics "taking issue with the film's heavy use of CGI and numerous plot holes" while "celebrating its message of female empowerment and diversity." In 2010, DuVernay directed three TV documentaries. The first, a two-hour concert film TV One Night Only: Live from the Essence Music Festival, a mix of live performances and behind-the-scenes vignettes, which aired August 28, 2010 on TV One, showcases the U.S.'s largest annual African-American entertainment gathering, the Essence Music Festival, which in 2010 took place July 2–4 in New Orleans. Two days later, BET premiered its first original music documentary, My Mic Sounds Nice: A Truth About Women and Hip Hop, a 41-minute long history of female hip hop artists. On Thanksgiving 2010, TV One showed the 44-minute documentary special Essence Presents: Faith Through the Storm about two black sisters who reclaimed their lives after personal devastation during Hurricane Katrina. "It was done for a client, for Essence. They wanted to talk about how faith helped them through, that was very important to them. So it is interspersed with gospel music, images of Katrina, their home and family." ESPN commissioned DuVernay to produce and direct Venus Vs., a documentary on Venus Williams' fight for equal prize money for their film series Nine for IX, which aired on July 2, 2013. DuVernay directed the John Legend episode of the performance-and-interview series HelloBeautiful Interludes Live which was shown September 14, 2013 on TV One as the series' broadcast premiere. She also directed the eighth episode of the third season of the political thriller television series Scandal. The episode, titled "Vermont is for Lovers, Too", premiered on November 21, 2013 on ABC. In 2015, DuVernay executive produced and directed the CBS civil rights crime drama pilot For Justice starring Anika Noni Rose. It was not picked up for distribution. That same year, DuVernay announced she would be creating and executive producing the drama series Queen Sugar, based on Natalie Baszile's novel. Queen Sugar premiered September 6, 2016 on Oprah Winfrey Network to critical acclaim and positive reviews. DuVernay directed two episodes and wrote four. On August 1, 2016, the series was renewed for a second season ahead of its television premiere which aired in a two-night premiere on June 20 and June 21, 2017. The series was renewed for a third season on July 26, 2017. In 2013, DuVernay partnered with Miu Miu as part of their Women's Tales film series. Her short film The Door starred actress Gabrielle Union and reunited DuVernay with her Middle of Nowhere star Emayatzy Corinealdi. The film premiered online in February 2013 and was presented at the Venice Days sidebar of the 70th Venice International Film Festival in August. Also in August 2013, DuVernay released, through Vimeo, a second branded short film entitled Say Yes. The film was sponsored by cosmetic brand Fashion Fair and starred Kali Hawk and Lance Gross with Julie Dash, Victoria Mahoney, Lorraine Toussaint and Issa Rae appearing as extras. In 2015, Apple Music and their ad agency Translation hired DuVernay to helm a series of three commercials starring Mary J. Blige, Taraji P. Henson and Kerry Washington. The first ad, Chapter 1, premiered during Fox's Emmy broadcast on September 20, 2015. Chapter 2 and Chapter 3 debuted in November 2015 and February 2016, respectively. Her music video for the Jay-Z ft. Beyoncé song "Family Feud" premiered December 29, 2017 on Tidal. In 2010 DuVernay founded African-American Film Festival Releasing Movement (AFFRM), her own company to distribute films made by or focusing on black people. DuVernay refers to AFFRM as "not so much a business, but a call to action." Although she sees building strong business foundations for films is a priority, DuVernay has said that she stresses that the driving force of the organization is activism. In 2015 the company rebranded itself under the name ARRAY, promising a new focus on women filmmakers as well. DuVernay also owns Forward Movement, a film and television production company. In 2013, she announced development on a narrative feature film entitled Part of the Sky and set in Compton. In 2015, it was announced that DuVernay would be writing, producing, and directing a fictional account which will focus on the "social and environmental" aspects of Hurricane Katrina while including a love story and a murder mystery. David Oyelowo was said to be part of the project. In 2018, it was announced that DuVernay would be directing a New Gods film for the DC Extended Universe. On October 29, 2018 it was announced that DuVernay would be working with the estate of Prince to direct a biopic covering his entire life, for Netflix. In September 2013, DuVernay started a podcast series called The Call-In, a series of phone conversations recorded by AFFRM of Black filmmakers of feature narrative and documentary work. On March 14, 2015, DuVernay gave a keynote address at the 2015 SXSW Film Festival. In the speech, she shared that she was the seventh choice of people asked to direct Selma and described her experience at the 2015 Oscars, while being an honor to be able to attend, it was just "a room in L.A."
In February 2018 it was announced that DuVernay, along with producer Dan Lin and Los Angeles Mayor Eric Garcetti, had launched the Evolve Entertainment Fund. The fund's mission is to promote inclusion and provide an opportunity for under-served communities to pursue a dream in the entertainment industry. Michael T. Martin says, "DuVernay is among the vanguard of a new generation of African American filmmakers who are the busily undeterred catalyst for what may very well be a black film renaissance in the making." He further speaks of DuVernay's mission and "call to action" which constitutes a strategy "to further and foster the black cinematic image in an organized and consistent way, and to not have to defer and ask permission to traffic our films: to be self-determining." 2013 Scandal Yes No No Episode "Vermont is for Lovers, Too"
In 2012, Variety featured DuVernay in its Women's Impact Report. In June 2013, she was invited to both the director's and writer's branches of AMPAS. DuVernay was only the second black woman, following Kasi Lemmons, to be invited to the director's branch. DuVernay became the inaugural recipient of the Tribeca Film Institute's Heineken Affinity Award, receiving a $20,000 prize and industry support for future projects. DuVernay donated all the money to AFFRM, the black arthouse film collective she founded. In June 2015, Duvernay was honored as part of Women in Film Crystal + Lucy Awards with the Dorothy Arzner Directors Award. In April 2015 DuVernay was chosen as one of Mattel's "Sheros" of 2015. As such a custom-made one-of-a-kind Barbie in DuVernay's likeness was produced. The doll was auctioned off with the proceeds given to charity. Due to high demand, a collectible version of the doll was produced and sold in December of that year. In 2017, DuVernay became the first black woman nominated for an Academy Award for Best Documentary Feature, for her film 13th. In 2017, DuVernay was the recipient of Smithsonian Magazine's American Ingenuity Award for Visual Arts. In 2018, DuVernay won Entertainer of the Year at the 49th NAACP Image Awards for her work in 2017. PETA declared DuVernay and actor Benedict Cumberbatch to be the Most Beautiful Vegan Celebs of 2018. The "DuVernay test" is the race equivalent of the Bechdel test (for women in movies), as suggested by New York Times film critic Manohla Dargis in January 2016, asking whether "African-Americans and other minorities have fully realized lives rather than serve as scenery in white stories." It aims to point out the lack of people of color in Hollywood movies, through a measure of their importance to a particular movie or the lack of a gratuitous link to white actors. ^ Demby, Gene (January 30, 2012). "Sundance 2012: Ava DuVernay Becomes First Black Woman To Win Best Director Prize For Middle Of Nowhere". The Huffington Post. ^ Farabee, Mindy (December 20, 2012). "Ava DuVernay no longer in 'Middle of Nowhere'". Los Angeles Times. ^ Ford, Rebecca (December 11, 2014). "Golden Globes: 'Selma's' Ava DuVernay Becomes First Black Woman to Receive Director Nomination". The Hollywood Reporter. ^ Suskind, Alex (December 17, 2014). "How Ava DuVernay struck a chord with Selma". The Guardian. ^ a b c Keegan, Rebecca (August 3, 2016). "With 'A Wrinkle In Time,' Ava DuVernay will pass a milestone". Los Angeles Times. ^ "Ava DuVernay becomes first black woman to direct a $100 million movie". Chicago Tribune. Associated Press. June 22, 2018. ^ Cunningham, Todd (August 16, 2015). "Ava DuVernay Reviews 'Straight Outta Compton' in 18 Tweets: 'They Got It Right'". TheWrap. ^ Simon, Bob (February 8, 2015). "Where 'Selma' Meets Hollywood" (TV interview/segment). 60 Minutes. CBS News. ^ Edwards, Gavin (January 5, 2015). "We Shall Overcome: Ava DuVernay on Making 'Selma'". Rolling Stone. ^ "SJ Alumna Receives A Golden Globe Nomination". St. Joseph's High School. Retrieved January 13, 2015. 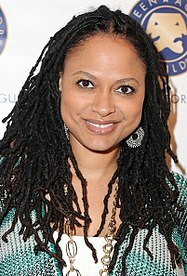 ^ a b "Ava DuVernay Biography: Documentarian, Screenwriter, Director (1972–)". Biography. February 27, 2018. ^ a b c Wright, Bekah (October 1, 2012). "Direct Actio". UCLA Magazine. University of California, Los Angeles. ^ Traister, Rebecca (September 19, 2016). "In Conversation: Ava DuVernay". The Cut. New York. ^ a b c d Miles, Ellene V. (2006). "Agoralumiere Film Series: Saturday Night by Ava DuVernay (USA)" (Press release). Agoralumiere at the Cannes Film Festival 2006. ^ Yuan, Jada (2 December 2014). "With Her MLK Drama Selma, Ava DuVernay Is Directing History". Vulture. ^ Stewart, Alicia W. (October 25, 2012). "Filmmaker Ava DuVernay uses a lens of legacy" (Includes video and transcript). CNN. ^ a b Rickey, Carrie (October 5, 2012). "She's a Graduate of an Unusual Film School". The New York Times. ^ Cooper, Nekisa (November 1, 2012). "Love on the Outside". Filmmaker. ^ Victoria, Da'ryl (March 23, 2016). "Breaking Barriers: Ava DuVernay Directs Things Her Way". The Source. ^ Pollard-Terry, Gayle (July 5, 2003). "Style videos could start a new wave of good hair days". Los Angeles Times. ^ Mitchell, Gail (November 1, 2003). "Firms Create Novel Marketing Twists". Billboard. ^ "DVA Media + Marketing". Retrieved February 4, 2018. ^ a b "HelloBeautiful.com Premieres Interludes Live! With Superstar John Legend On TV One Saturday Sep 14th @ 10 PM" (Press release). Interactive One. September 13, 2013. ^ a b c "Middle of Nowhere – Writer/Director Ava DuVernay". Filmmaker. January 20, 2012. ^ Williams, Kam (March 17, 2009). "Ava DuVernay 'This Is the Life' Interview with Kam Williams". NewsBlaze. ^ Brown, Emma (October 11, 2012). "In the Middle of Somewhere with Ava DuVernay and Emayatzy Corinealdi". Interview. ^ Ebert, Roger (2012). "I Will Follow (2010). Genres: Drama. Roger's Office: I Will Follow" (Video includes transcript). Ebert Presents: At the Movies. ^ Ebert, Roger (March 8, 2011). "I Will Follow". RogerEbert.com. ^ Fernandez, Jay A. (January 10, 2012). "Sundance Preview: Competition Drama 'Middle of Nowhere'". The Hollywood Reporter. ^ Smith, Celia L. (February 24, 2013). "Ava DuVernay Wins Independent Spirit Award for 'Middle of Nowhere'". Essence. ^ Davis, Rachaell (September 22, 2016). "Why Is August 28 So Special To Black People? Ava DuVernay Reveals All In New NMAAHC Film". Essence. ^ Obenson, Tambay (July 11, 2013). "Huge! Ava DuVernay Tapped By Brad Pitt's Plan B To Take Over Lee Daniels' 'Selma'". IndieWire. ^ Jagernauth, Kevin (June 20, 2014). "Ava DuVernay's 'Selma' Enters Oscar Race, Sets Christmas Day Release". IndieWire. ^ Hornaday, Ann (December 26, 2014). "DuVernay, David Oyelowo on breaking Martin Luther King Jr. out of myth and into life". The Washington Post. ^ Brody, Richard (December 29, 2014). "The Crucial Lessons of Democracy in "Selma"". The New Yorker. ^ Milliken, Mary (January 6, 2015). "'Selma' director makes history before awards are bestowed". Reuters. ^ Harris, Mark (January 28, 2015). "How 'Selma' Got Smeared: On historical drama and its malcontents". Grantland. ^ a b Goodman, Amy; DuVernay, Ava (January 27, 2015). "Selma Director Ava DuVernay on Hollywood's Lack of Diversity, Oscar Snub and #OscarsSoWhite Hashtag" (Video interview includes transcript). Democracy Now!. ^ "List of 87th Academy Award Winners". ABC News. Associated Press. February 23, 2015. ^ Ontiveros, Roberto (February 22, 2015). "Oscars 2015: A Look at Biggest Latino Oscar Winners of the Past". LatinPost. ^ Cox, Gordon (July 19, 2016). "2016 New York Film Festival to Open With Ava DuVernay Documentary 'The 13th'". Variety. ^ Smith, Nigel M. (September 26, 2016). "The 13th: inside Ava DuVernay's Netflix prison documentary on racial inequality". The Guardian. ^ Lockett, Dee (19 July 2016). "Ava DuVernay's The 13th Will Be the First Documentary to Ever Open the New York Film Festival". Vulture. ^ "13th (2016)". Rotten Tomatoes. Retrieved September 30, 2016. ^ "Oscar Nominations". Academy of Motion Picture Arts and Sciences. Retrieved January 24, 2017. ^ Garcia, Patricia (February 6, 2017). "Ava DuVernay Doesn't Want Praise, She Wants Change". Vogue. ^ Nordyke, Kimberly; Lewis, Hilary (18 April 2017). "Peabody Awards: Norman Lear, 'Lemonade,' 'Atlanta,' 'Veep' Among Winners". The Hollywood Reporter. ^ "Winners of the 2018 duPont-Columbia Awards". Columbia University in the City of New York. ^ Kendrick, Ben (March 23, 2010). "Script in the Works for 'A Wrinkle in Time'". Screen Rant. ^ Fernandez, Jay (October 14, 2010). "Bedrock taps Jeff Stockwell to adapt 'Wrinkle'". The Hollywood Reporter. ^ McNary, Dave (August 5, 2014). "'Frozen' Director Jennifer Lee to Adapt 'A Wrinkle in Time' for Disney". Variety. ^ Han, Angie (August 5, 2014). "'Frozen' Director Jennifer Lee to Adapt 'A Wrinkle in Time'". Slash Film. ^ Kit, Borys (February 8, 2016). "Lupita Nyong'o in Talks to Star in Sci-Fi Thriller With Ava DuVernay Eyed to Direct (Exclusive)". The Hollywood Reporter. ^ CNN, Lisa Respers France, (12 March 2018). "This weekend was the first time films by black directors with mega budgets held the top 2 spots at the box office". CNN. ^ "The lone loser in Disney's big quarter: 'A Wrinkle in Time'". Yahoo! Finance. May 8, 2018. ^ Kirsten Chuba (March 7, 2018). "'A Wrinkle in Time' Reviews: What the Critics Are Saying". Variety. ^ "TV One features specials of the 2010 Essence Music Festival, Washington Watch and Life After, Aug. 29-30". The Philadelphia Sunday Sun. August 29, 2010. ^ "Female Emcees Say 'My Mic Sounds Nice'". NPR. August 30, 2010. ^ Gilmore, Jason (November 12, 2010). "An Interview with Ava DuVernay". Intrepid Media. ^ "Nine for IX: 'Venus Vs.'". ESPN. June 26, 2013. Archived from the original on May 27, 2013. ^ Obenson, Tambay A. (July 12, 2013). "Ava DuVernay Will Direct An Episode Of 'Scandal' Next Season". IndieWire. ^ Goldberg, Lesley (March 10, 2015). "'Selma's' Ava DuVernay 'For Justice'". The Hollywood Reporter. ^ Andreeva, Nellie (February 2, 2015). "Oprah Winfrey To Co-Star In & Co-Create With 'Selma' Filmmaker Ava DuVernay 'Queen Sugar' OWN Drama Series". Deadline Hollywood. ^ Wilson, Stacey (February 18, 2015). "'Selma' Director Ava DuVernay on 'Awkward and Weird' First Meeting With Oprah Winfrey". The Hollywood Reporter. ^ "Queen Sugar (2016 - 2017)". Rotten Tomatoes. Retrieved September 30, 2016. ^ Patten, Dominic (August 1, 2016). "Ava DuVernay-Directed 'Queen Sugar' Gets Season 2 Pickup From OWN – TCA". Deadline Hollywood. ^ "OWN Gives 'Queen Sugar' an Early 16-Episode Second Season Renewal + A New Trailer". Shadow and Act. August 1, 2016. ^ Porter, Rick (July 26, 2017). "'Queen Sugar' scores Season 3 renewal on OWN". TV by the Numbers. ^ ""The Door" by Ava DuVernay: Women's Tales #5". Miu Miu. 2014. ^ Small, Rachel (February 11, 2013). "Ava DuVernay Brings Us Through the Door". Interview. ^ Rothe, E. Nina (August 30, 2013). "Best of Venice 70: 'Miu Miu Women's Tales' – The Door and Le Donne della Vucciri". Huffington Post. ^ DuVernay | Say Yes on Vimeo, uploaded August 8, 2013. ^ "Fashion Fair presents Say Yes by Ava DuVernay". Ebony. August 16, 2013. ^ Diaz, Ann-Christine (September 21, 2015). "How Apple Music's Star-Studded Emmys Ad Came Together". AdAge. ^ "Ava DuVernay". Creativity. AdAge. 2018. ^ Stefansky, Emma (December 30, 2017). "Jay-Z Confesses His Sins to Beyoncé in Ava DuVernay-Directed "Family Feud" Music Video". Vanity Fair. ^ Cieply, Michael (January 7, 2011). "Building an Alliance to Aid Films by Blacks". The New York Times. ^ a b c d Martin, Michael T. (Fall 2014). "Conversations with Ava DuVernay—"A Call to Action": Organizing Principles of an Activist Cinematic Practice". Black Camera. 6 (1): 57–91. doi:10.2979/blackcamera.6.1.57. ^ "Ava DuVernay | Heineken Affinity Award". Strutta. Archived from the original on October 30, 2014. ^ Rosenberg, Alyssa (January 26, 2015). "'Selma' criticism isn't stopping Ava DuVernay". The Washington Post. ^ Gettell, Oliver (January 26, 2015). "Ava DuVernay, David Oyelowo to reunite on Hurricane Katrina drama". Los Angeles Times. ^ McNary, Dave (March 16, 2018). "Ava DuVernay to Direct DC's Superhero Epic 'New Gods'". Variety. ^ Macaulay, Scott (September 19, 2013). "Ava DuVernay and AFFRM Launch Podcast, 'The Call In,' with Andrew Dosumnu". Filmmaker. ^ Setoodeh, Ramin (March 14, 2015). "'Selma's' Ava DuVernay: 'Studios Aren't Lining Up for Black Protagonists'". Variety. ^ "Ava DuVernay Keynote". SXSW. March 2015. ^ Obenson, Tambay A. (March 17, 2015). "Watch Ava DuVernay's Rousing SXSW Keynote Address". IndieWire. ^ Canfield, David (March 18, 2015). "SXSW: The 7 Best Things We Learned From Ava DuVernay's Keynote Speech". IndieWire. ^ Abramovitch, Seth (March 14, 2015). "SXSW: Ava DuVernay Calls Oscars a "Room in L.A." at Rousing Keynote". The Hollywood Reporter. ^ McNary, Dave (12 February 2018). "Ava DuVernay, Dan Lin, Los Angeles Mayor Eric Garcetti Launch Inclusion Fund". Variety. ^ Weisman, Jon (June 28, 2013). "Film Academy Invites 276 New Members". Variety. ^ "Tribeca Film Institute's Inaugural Heineken Affinity Award Goes To Ava DuVernay ($20,000 + Industry Support)". IndieWire. April 21, 2013. ^ Kang, Inkoo (March 31, 2015). "Nicole Kidman, Ava DuVernay, Jill Soloway Among Women in Film's 2015 Crystal + Lucy Awardees". IndieWire. ^ Lee, Benjamin (April 24, 2015). "Holding out for a Shero: Selma director Ava DuVernay gets her own Barbie doll". The Guardian. ^ Cunningham, Todd (December 6, 2015). "Ava DuVernay Barbie Doll to Go on Sale Monday, Director Says". TheWrap. ^ "Meet the SuperSoul100: The World's Biggest Trailblazers in One Room". O, The Oprah Magazine. August 1, 2016. ^ Riley, Jenelle (October 3, 2016). "2017 Oscars: Diversity Makes Comeback, Record Six Black Actor Nominees". Variety. ^ "Best Documentary Feature". Daily Herald. January 18, 2017. ^ "2017 American Ingenuity Award Winners". Smithsonian. Retrieved 2018-10-15. ^ "NAACP Image Awards: Full List of Winners". The Hollywood Reporter. January 14, 2018. ^ Furdyk, Brent (11 July 2018). "Benedict Cumberbatch, Ava DuVernay Named PETA's 'Most Beautiful Vegan Celebs' Of 2018". ET Canada. ^ Tapley, Kristopher (December 23, 2014). "'Selma' dominates Black Film Critics Circle awards". HitFix. ^ Dargis, Manohla (January 29, 2016). "Sundance Fights Tide With Films Like 'The Birth of a Nation'". The New York Times. ^ Evans, Dayna (February 1, 2016). "Could This Be the Bechdel Test for Race". The Cut. New York. 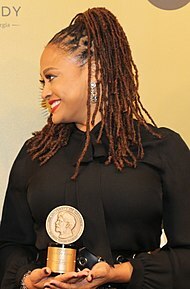 Wikimedia Commons has media related to Ava DuVernay.